Emmett ingested a button battery that was housed in the remote control to our family room DVD player almost two and one half years ago. The damage was so significant that every since Emmett has depended on a feeding tube that was surgically placed in this stomach (G-tube) to supply him with his adequate nutrition. 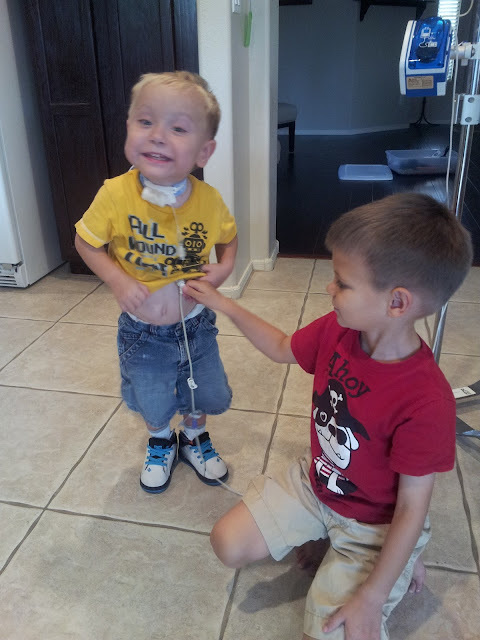 Emmett currently has a (GJ-tube) that by passes his stomach and feeds right into his small intestines. We tell Emmett he just has two belly buttons... one is his original... the second is his GJ-tube. He thinks it is pretty neat! Hundreds of thousands of children and adults depend on feeding tubes for various reasons and conditions. It is so important that those using these feeding devices feel the support of those in their community. This is why we are sharing Emmett's story and reason for why he uses a feeding tube! We are so grateful for modern medicine and God's hands in all things! Over the past 3 years, our family has come to know many families who have found comfort and benefit from the incredible services that the Ryan House provides. For a family whose child's life depends on complicated machines, equipment and around the clock intensive care, it provides them with the opportunity to have a little break, with little to no concern. Sometimes as parent's we take for granted calling up a babysitter for running an errand or going out on a date with our spouse. Their are many parent's in the community who do not have this simple luxury. Their child needs a babysitter with experience of a skilled nurse. The Ryan House provides this care. The Ryan House also provides Palliative Care, end of life planning and care. Our family has come to know and love two dear families who has had to experience this unfortunate event. The House provides a more comfortable environment for families to say goodbye to a loved one, outside of the hospital walls. The Ryan House is a beautiful organization and for them to be able to provide the much needed care if provides it needs the help from the community. 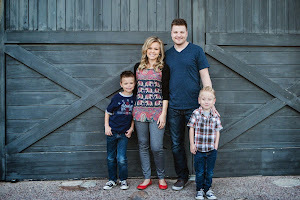 A beautiful family with two adorable kiddos with unique and special needs. I met Crystal through Facebook. I posted on Emmett's Fight months back about my concerns of Emmett flying for the first time out to Cincinnati. I was stressed over how I was going to pack for a child who depended on so much medical equipment. Crystal sent me a message about how she juggled flying with her children and sent me the link to her Blog. I was so grateful! I followed he suggestions to a "T". I also was drawn to her story seeing that she was a mother whose child had a Trach and a G-tube as well. I have been amazed by her courage and strength and enjoy fallowing her "Wild Man Willies" progress. Watch the video below and meet Crystal and Willie. Now you can all see why I follow this amazing families adventures. What a cutie pie that little Willie is! On top of all that Crystal and her husband have to do at home, they are helping the Ryan House raise money for the upcoming fundraiser, Run for Ryan House. They have created a team called Team William which has been made the face of 2013 Ryan House Run. Yahoo! 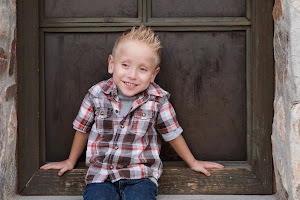 To help Team William raise money for the Ryan House, please visit Team William's Page. For all of those running fanatic's out their in Phoenix sign up and support the run. 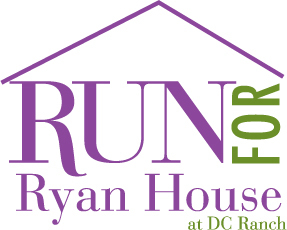 Visit Run for Ryan House for more details and to register. Preregistration closes on the February 28th. The race March 2nd, 2013.